Two years ago I wrote an article “Understand your reasons”. I want to clarify it a little further. There is a value system theory, well described by Ray Jackendoff in a book “Language, Consciousness, Culture”, ISBN-13: 978-0-262-10119-6, 9788-0-262-51253-4, page 301. He went into deep details, defining 8 different value types. For this article, oversimplified model with just two types is enough. These two types are: “Affective”, i.e., what feels good, and “Utility”, i.e., what is indeed good for you. “Understand your reason” was a good overview, but now it is time to put together some system. First, let’s set apart two of your most precious resources - time and health. Let’s look separately at values of what you consume and values that dictate what you spend your time on. 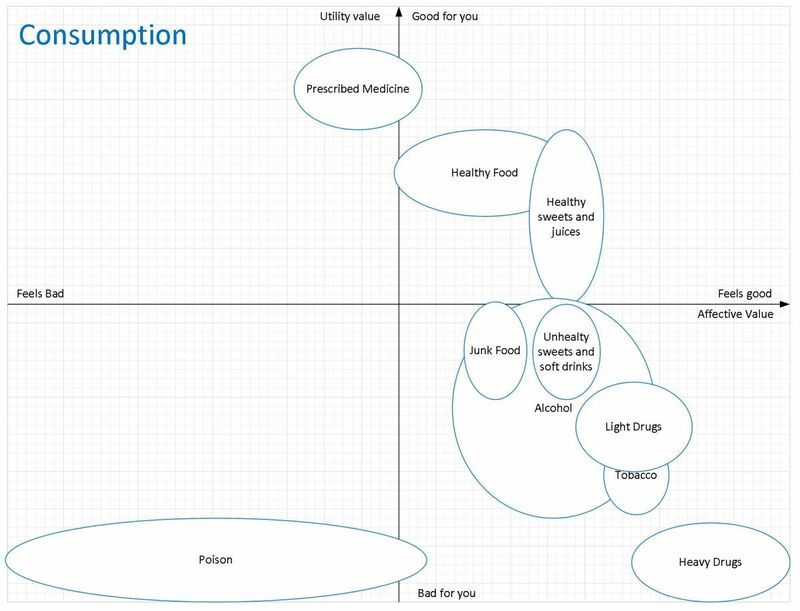 Next, let’s put affective and utility value on a chart axes and draw different things we consume on the first chart and different activities on the second one. 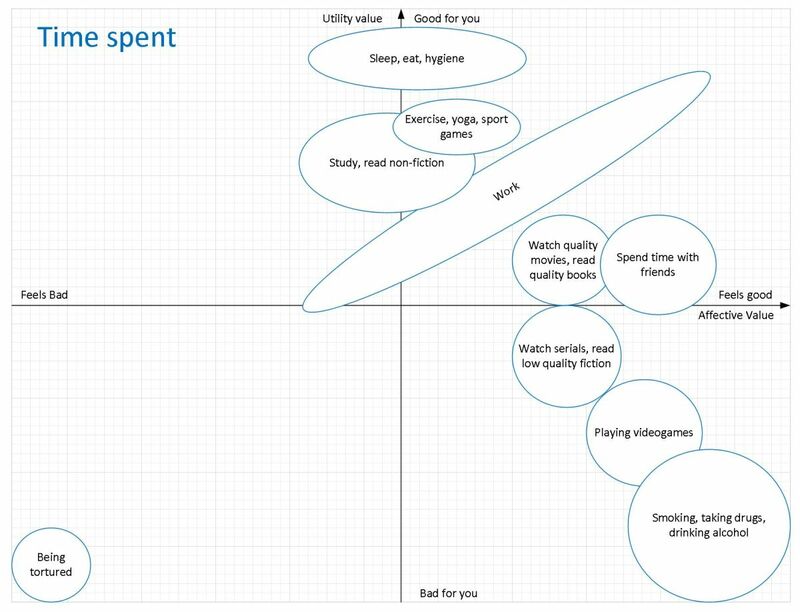 On both charts, Affective value is on the horizontal axis, and Utility value is on the vertical one. You can argue how much left or right, up or down we shall move these or those items, but that is not that critical. What is important - you either understand the difference and use self-control and self-discipline, or you will very likely be “happily” wasting your most precious resources. Shall you stop eating cakes and doing what you like? You should be careful with that, because depriving yourself from all the fun could lead to lack of motivation, depression and other bad consequences. However, please do it in moderation and make sure they are not very far down on the charts. If you believe, that your chart is very different from what you would draw - great, make your own. The more sincere you do it, the better you will be able to find your “sweet spot” trade-offs. I wish you self-discipline to stay on your healthy and purposeful course of life!